A few weeks ago, a relative who shall remain nameless stumbled across a gimmick manufactured by Ancestry.com, which claims to be "the world's largest resource for family history documents and family trees." The gimmick is a book. The title of the book is The [insert your name here] Name in History. You can buy this book -- yes, a book about your name, about you, in History -- on Amazon (among other places). If your name is Caravaggio, for example, and you search Amazon's book catalog, you'll find it at #52 (or thereabouts), nestled among books having to do with the eponymous painter, and a few novels (none of them by Michael Ondaatje). Worse, a different relative, also unidentified for the protection of her/his own cred, having been alerted to the existence of this gimmick, took the bait. The purchase came to $29.99, which made it Eligible for Free Super Saver Shipping. Worst, when the silly thing arrived, I got tasked with examining it and explaining to those of my blood kin who'd been tricked into giving this matter a passing thought just what it is. Presumably so they won't buy one for themselves. "This book is part of the Our Name in History series, a collection of fascinating facts and statistics, alongside short historical commentary, created to tell the story of previous generations who have shared this name. The information in this book is a compendium of research and data pulled from census records, military records, ships' logs, immigrant and port records, as well as other reputable sources." 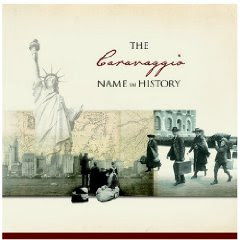 If your name is Caravaggio, I suppose there might be a rich vein of census records, military records, ships' logs, immigrant and port records, and other sources -- reputable and not. If your name is Masover this is not the case. What my family gets out of this ... product ... are pages like the Historical Timeline that runs from 1840 to Today, with 9 detail boxes describing what Masovers were up to during this period. Where there are no census records, military records, ships' logs, etc. related to Masovers, generic factoids gleaned from the Historical Record are printed: 1840 - 2.6 million households with most living in New York. Fascinating. The Masovers scored 4 factoids out of nine on the timeline that aren't generic. Those factoids tell how many Masovers were registered for the U.S. draft during World War One (7); how many Masover households there were in 1920 (3); how many Masover soldiers served in the U.S. Armed Forces during World War Two (2); and where most Masover households live today (California and Illinois). The rest of the book is similarly constructed. Boilerplate generalities with mostly-uninteresting particulars inserted using the print-on-demand equivalent of your favorite word processor's merge function. In fact, the whole book is kinda thin, 71 pages unless you count the back matter, titled "Discover Your Family," and consisting of some framing context, some worksheets, a glossary, and a set of "selected sources." As suggested by the factoids cited above, the in History part of the title is a little disingenuous. These are 'Merican records that are mined, so really we're talking The [insert your name here] Name in the U.S. Bureaucratic Record. I can't wait to give it back to the unnamed relative who forked over money for this thing. The blogosphere is beginning to buzz about Macmillan's announcement of its Dynamic Books publishing platform for electronic, digital textbooks, to launch in August. It came to my attention Monday (22 Feb 2010) via the Chronicle of Higher Education. The news was reported in Publisher's Weekly the same day; the New York Times story is datelined the day before, but the URL suggests the Grey Lady might have fiddled with her timecard. The launch, timed to coincide with the rampup to Fall term 2010 on campuses everywhere, will be modest: 100 titles. This is a small dent, but in a non-trivial market: there were 17.7 million college students in the Fall of 2006, according to the National Association of College Stores ... and the average student spends $700-1000 annually on course materials, according to Turn The Page: Making College Textbooks More Affordable (a May 2007 report of the Advisory Committee on Student Financial Assistance). Multiplying the apples times the oranges, that's more than $12 billion any way you slice or section, in a U.S. book market pegged at "between $23.7 billion and $28.5 billion" according to statistics from the Book Industry Study Group, publishers.org, and others cited on parapub.com. "Non-trivial" is something of an understatement here. The Turn The Page... report suggests that "many of today’s instructors envision an environment in which they can assemble instructional materials from a variety of print, electronic, and video sources for their students, rather than choose all materials from any one publisher." Anybody who has purchased a professor-assembled, photocopied "reader" is familiar with this concept ... it was in vogue when I was an undergraduate, and that was decades ago. But Dynamic Books goes some distance further along the social media path. The big news here is that professors will have the ability and incentive to customize published textbooks to their particular classes, including the option to add their own material, edits, and illustrations. That is to say, the published textbook will be a framework on which a professor can stamp her own pedagogical mark. How cool is that? The books will be readable on laptops, iPhones and the soon-to-launch Apple iPad. They'll be cheaper than printed books, as e-book editions tend to be. Publishers like this concept because it cuts used books out of the loop (in an earlier post, I mentioned this point made by Dan Poynter at the SF Writer's Conference this year, in reference to e-books generally), and textbook authors will see similar (if not quite so lucrative) benefit too. Students who buy textbooks like the lower prices (lower even than used books) and the portability implicit in many-books-one-device content delivery. In Macmillan's offering, professors not only get to teach as they wish, but have a financial incentive as well. As the CHE article put it: "Professors who customize a textbook have a chance to make some extra money. For each customized copy that a student buys, the professor who contributed the material gets a dollar. That could add up if a professor's retooled book becomes popular and is assigned by professors at other colleges." In my professional incarnation I've been involved with Project Bamboo for the last two years or so. In wide-ranging discussions around multi-institutional support for arts & humanities scholarship there's been a lot of interest in "crowdsourcing," (where distributed groups or communities contribute to a large project in small increments -- the Wikipedia thing, though Wikipedia founder Jimmy Wales finds the term "incredibly irritating"). At the same time, faculty whose long years of study and peer-reviewed authority are primary assets, the ability to measure and validate the reliability of information is a major concern. It may be that the facultysourcing enabled by Dynamic Books hits that nail right on the head. "I see a lot of guys here. But guys don't buy books." Yow. This, I thought to myself, is a woman with a very different perspective than mine. And it's her job to know what she's talking about. All the guys I know buy books, and read them. Okay, not all the guys I've ever met, but all the guys I'd call a friend -- even a Facebook friend! Even the guys I know who pay attention to sports also pay attention to books (sorry sports fans, personal blind spot there). But Ms. Rapp wasn't the only one talking about women as the market that matters for books. Rebecca Oliver, an agent with William Morris Entertainment, said almost the same thing in a hallway conversation: since most books are sold to women, she remarked, "all books are ultimately women's books." The press release for Bowker's 2008 report, 2008 U.S. Book Consumer Demographics and Buying Behaviors Annual Report ($999 for single-use PDF!) says that "57% of book buyers are women" and "women purchase 65% of books sold in the U.S." (that's nearly two-thirds, or it was the last time I did the long-division). And "women made the majority of purchases in the paperback, hardcover and audio-book segments" though "men accounted for 55% of e-book purchases" (way to go, guys...). A fascinating set of slides presented by Kelly Gallagher, also of Bowker, and apparently riffing off the same report, counts mystery/detective (34%) and romance (24%) genres as more than half of the fiction market. Women are 63% of all fiction buyers, 73% in general fiction, and (no surprise) 84% in romance fiction. The only genre category in which guys take the prize is science fiction, at 55%. When you start counting dollars spent, the numbers are even more skewed: women pay 71% of dollars spent on fiction. What does that mean to an author who is also a man? Maybe not so much? Consider Grisham, King, Brown. Updike, Roth, Murakami. And my reading group. Membership fluctuates, but over our 11+ years we've been mostly women by a long stretch (for years I was the only guy) ... but two-thirds of the books we've read together were written by men. The book we just discussed last night was written by a woman in a man's voice (Gilead, by Marilynne Robinson). What do you think? If you're a woman, does the fact that a book was written by a man make you less inclined to read it ... or more inclined ... and why? If you're a man, what proportion of the books you read are written by women, and how would you characterize the difference -- if you see any? As I prepared to pitch my recently-completed novel (Consequence is the working title) to agents at the SF Writer's Conference last weekend, one of the murkiest questions I had to clarify was whether I'd written a work of literary fiction or ... something else. I never thought much about this before. That is, I had an opinion -- I thought I was writing literary fiction -- but never really questioned whether that was actually so, or why. Why did I think my fiction fit that category? Well. Um... Because it clearly isn't genre mystery, thriller, romance, or police procedural? Because it includes at least a couple of big words in every chapter? Because I have a degree in English Literature, from a top university? As my grandmother might have said, "Feh!" None of these seemed especially convincing, maybe not even marginally credible, once it was time to tell a well-read publishing-industry expert & perfect stranger, in sixty seconds or less, about the product of my every spare moment gleaned from the past [number redacted] years of my rather inconsequential life. What to do? I Googled, of course. And discovered, unsurprisingly, that this question has vexed plenty of authors, agents, and editors before me. What is literary fiction? How does it differ from "commercial" fiction (leaving the more clearly demarcated genres aside)? In fact, the question was the topic of lunch conversation on the first day of the SFWC, when I met agent & entertainment attorney Paul S. Levine, whose bracingly no-nonsense answer to the confusion was that the difference is a red herring. It doesn't matter at all, said Mr. Levine. Guy walks into a bookstore. It's all in the "Fiction" section, alphabetized by author. Case closed. A number of others at SFWC said roughly the same thing (Caitlin Alexander, a senior editor at Random House: "It's fairly arbitrary"). The "I know it when I see it" defense seems to be popular. Plot first (commercial) vs. character/voice first (literary) is another well-used set of markers. But it gets vague very quickly. My novel is about characters grappling with the moral and political themes that drive the plot forward ... but it certainly has a plot, and tension, and conflict, and even a bit of romance. In the end there's blood, triumph, tragedy, and even a big 'splosion. So what is it? The most coherent musings on the question I've seen were contributed to the intertubes by Nathan Bransford, an agent with Curtis Brown, who blogged on the topic of What Makes Literary Fiction Literary following the 2007 SFWC. I won't steal his well-articulated thunder, but he boils his distinction down to this: "In commercial fiction the plot tends to happen above the surface and in literary fiction the plot tends to happen beneath the surface." This is more-or-less the Plot vs. Character line, but Bransford gives his answer some nicely knitted nuance. Check him out. In the end what seemed most helpful to thinking out my own answer was to consider the attributes of books I like best. While page-turning plot is as gripping to me as to anyone, I have often noticed that if a book offers a lot of plot and a lot more than plot, and if I want to get a lot more than relief of plot tension out of it, I have to read it twice. That is, plot can distract me from what I most care about in a book. Or, alternately, I devour plot like candy, which is terrific for a while, but if I want something from a book that lasts beyond the sugarplot rush I have to go back and mine the work's deeper strands after resolving the plot-tension by reading through to the end. These are the best kinds of books for me: the ones that pull me along with heart firmly lodged in throat, only to leave me wanting to go right back to Page 1 and start again. I want to read about characters grappling with real issues. With questions that matter. This doesn't have to be arcane or intellectual. Cormac McCarthy's The Road, to take a commerical-literary hybrid, has pretty superficial plot concerns. Getting to the coast. Avoiding the cannibals. Eating (but not eating other people, thank you very much). But what matters in that exquisitely spare and mercilessly taut novel is that a man is spending everything he has and is to save his son. There was no question as I read The Road that this character was on a quest, that his drive was moral and primal, that completing his mission was as substantial an undertaking as anything a human being might be called upon to achieve. I've read for diversion before, and enjoyed it. But even in my adolescence, when I gulped down science fiction by the shelf-foot, what stayed with me longest, what compelled re-reading, were stories that addressed a moral dimension. Those are the books I remember, and the ones that seem worth caring about. So to spin Nathan Bransford's distinction: perhaps commercial fiction describes what it's like to navigate a world; whereas literary fiction reveals what it's like to be. When it came time for me to pitch agents at the SFWC last Sunday morning, I told them something like this: "I thought I was writing literary fiction, maybe it's commercial crossover, but after hearing the categories blur at this conference I think I'll let the agents and editors duke it out." I guess I'll start with some more about Smashwords 'cuz Mark Coker (founder) was at the conference (the presentation audio and slides can be accessed via Mark's blog). Smashwords has been around for about a year, and claims to have published 387,372,989 words as of tonight. They list 16 fiction categories in their catalog, and ten in non-fiction (including poetry ... which strikes me as kind of odd, actually ... I'm thinking W.B. Yeats, "Who Goes With Fergus," for whatever perverse reason ... or Ovid ... or ...). 3,567 authors. 7,807 titles. As I wrote in my last post, the drill is to upload electronic manuscript and Smashwords converts it ten e-book formats, then lets the author set a price. So one of the questions that's begged here is whether people buy e-books. Another has to do how an author ought to set a price for her/his work. Do people buy e-books? The jury hasn't been fully polled on this one, as far as I can tell. According to Mark Coker, about 2.3% of the market last year was sales of e-books. Jeff Bezos of Amazon said last month that where both e-books and printed formats are available, 6 e-books are sold for each 10 paper copies. E-books seem to be an impulse buy (cheap, easy, fill up your nifty new device). Coker's nifty graphs showed wholesale e-book revenue coming in at $100M in 2008, and an estimated $200M in 2009. E-books, Coker says, are "the fastest growing segment of the publishing industry." You get published instantly. You never go 'out of print.' You can publish at any length (short stories, a poem, a 100,000 word novel). Some of the most provocative ideas Coker put forward had to do with pricing. For example, he suggested that higher prices may encourage piracy: if it's cheap, why go to the trouble of moving a file from one device to another, just download another for cheap? (I will say, in counterpoint, quoting a certain sophomore at UC Berkeley who will remain unnamed in this blog, that "college students never pay for downloading music" ... and if that's so, the "people don't share e-books" trope is probably not far from myth). But this was really interesting: in a (very small sample size) experiment in which books were offered for whatever a consumer chose to pay -- where free is an option -- 85% didn't pay anything. But. 15% did, and they paid an average of $3.20 (a $3.00 mean for the statisticians out there). When you average out the price paid among those who paid nothing and those who paid something, the figure came to $0.49 per copy distributed. Coker's suggestion: that's not so bad at all if you can get your book read, which is often an author's principal goal ... and it's lucrative as anything if you can get it read widely. His rhetorical question was a little, well, rhetorical, but when he asked who would take $0.49/copy if they could get a million readers pretty much everybody in the room put their hand up. One of Coker's best soundbytes was this: "An author's enemy is obscurity not piracy." That's worth a second thought. What's that you say about self-publishing, sonny? One of the tensions at the SF Writer's Conference featured the many writers attending in order to get a leg up in a traditional publishing track -- agent, NY publisher, $25 hardcover editions, well-oiled distribution machinery, reviews, bestseller lists, reprints -- confronting enthusiastic promoters and enabling vendors of self-publishing opportunities and viral marketing and e-book formats. Dan Poynter delivered a keynote at the end of the first day of the conference. Likening the changes roiling the publishing industry to a wind that no author can control, he recommended trimming sails as the only viable option. Publishers, he asserted, are running out of money. The business model is broken, and the big houses are too stuck in their ruts to contemplate fundamental changes. Throwing seven figure advances at celebrity authors is nothing more than a series of desperate Hail Mary passes. Independent bookstores are folding, so fewer resources are devoted to pre-publication reviews aimed at their buyers, and there are fewer sales reps servicing them. As independents fade away, so will the practice of returning unsold books back to publishers (an option that encourages independents to risk shelf-space on new & unknown work) -- and thus remaindered books will go the way of the dinosaurs too. As e-books gain traction, there will be no used books either ... and this is a good thing for authors, because they'll get paid for each new reader (e-books, claims Mr. Poynter, don't get passed around the way those old fashioned, germy paper things do ... especially if they're priced low). Something has to change, and since authors can't change publishers' behavior or market tendencies, we ought to change how we conduct ourselves in rapidly shifting conditions. Okay, Poynter didn't say anything about germy paper. But he was terrifically entertaining, in the mode of a snake-oil salesman ... and he might even be right about the rigidity and vulnerability of the large publishing houses, what do I know? I can say that his talk made me nervous. After all, I was attending the conference to get a leg up in the traditional publishing track. Mr. Poynter didn't have much good to say about the Six Sisters -- the last publishing conglomerates standing in the current trade publishing market, Bertelsman AG; Simon & Schuster; Hachette Book Group, USA; HarperCollins; Penguin Group; and MacMillain U.S. Poynter said the publishers owned by these conglomerates -- the New York houses -- take too long to bring a book to print, increasingly produce cheaply crafted editions, and keep most of the revenue generated on the backs of content-producing authors. As for the second of three available options he laid out, vanity presses, Poynter dismissed them as a scam. Okay. I'm with him there. What's left? Self publishing, says the sage -- especially in electronic formats. Do as Dan Poynter does. Smashwords, a conference sponsor, will take an author's manuscript as an electronic file, convert it to 10, count 'em, ten e-book formats, then permit the author to set whatever price s/he chooses. No fee to publish. Each time someone buys a copy, Smashwords takes a 15% cut if the e-book is sold from their site, more (up to 58%) when the sale is made through a major online retailer, like Amazon. The content creator gets the rest, which is a better deal than any NY house will ever give any author. Publication is more or less instantaneous. Sounds pretty cool. Of course, there's plenty of fine print, much of it openly acknowledged on the Smashwords site. Leaving aside e-books (which made up perhaps 2.5% of the market in 2009, according to Smashwords founder Mark Coker in an SFWC session the following day) -- is this self publishing thing viable? Sticking to the facts, though, we learn from Bowker, the folks who bring you Books In Print, that 275,232 new titles and editions were published in 2008 (a decrease of 3.2% from the prior year). Fiction, I was sad to learn, suffered an 11% drop in new titles published during the same period. On the other hand, "On Demand" and "short-run" books scored 285,394, an increase of 132% over 2007 and 462% over 2006. In the big picture, then, Poynter seems to describe the shifting terrain accurately. On the other hand, his frame of reference is grounded in the fact that he writes non-fiction, a world in which platform -- the means by which an author reaches a book's audience directly, or DIY promotion -- is almost everything. I write fiction, though, and I'm left wondering how my mileage would vary (though Poynter did make sure to highlight a current reality of publishing, which was echoed by many others at the SFWC: promotion budgets allocated by the NY Houses for fiction are small or rare, and authors are largely expected to promote themselves). Poynter's 'argument' for the rising wave of e-book consumers was pretty flimsy ... he mentioned at least half a dozen times that he travels 'all the time' and that he 'always' sees people using e-book readers 'wherever he goes.' Well, yeah. Business travelers in big airport hubs, and the next seat over in business class? Duh. The cool new gadget, too much disposable income cohort. I'll freely acknowledge there's a lot of e-book potential on the horizon (e.g., Apple's iPad and the devices that Amazon and Sony will inevitably bring to market to compete with it) ... but I'm not seeing any done deals. To paraphrase a certain 19th century author, perhaps reports of the book's death have been exaggerated. It's generally accepted wisdom that many excellent manuscripts of all sorts never see the business end of a printing press. There's something random (or lucky) about who makes it over the hurdles to publication, and beyond that which excellent published books find their audience in time to avoid being burned to heat the warehouses that distribute the next crop of contenders (Poynter claimed that's what happens to books returned to publishers when they aren't temporarily revived as remainders ... and it may well be so). Does that mean that agents, editors, and publishers are failing to provide the 'gating,' the vetting, the quality control that is the core of their value proposition? Are they instead an impediment to information that wants to be free, and stories that want to be read? Are readers really better off choosing from 275,232 books published by publishers rather than 560,626 books published by publishers and authors combined? Is the New York Times Book Review a tyrant in a Grey Lady's disguise? Hey, I'm always happy to have books recommended to me by readers I know to have tastes that are reasonably congruent with my own -- especially if our differences skew suggestions in directions I might not have pursued in isolation. And I like to browse in bookstores, especially independent stores in which staff recommendations are featured in ways that cut through publisher-paid promotional fog. Those are modes of navigating potential reading material that don't appear to require publishers and editors to narrow my range of choices. Maybe keeping track of what my friends are reading on Goodreads or LibraryThing can and will supercede my reliance on editors and bookshop owners who have steered me well until the socially-networked now. But I'm certainly not sure enough to tear up my query letters, and neither were most of the authors I spoke with after that Friday evening keynote. In the end, Poynter sounded to me like a free market ideologue: it's the sales figures, stupid. And, by the way, quantity is a function of well-executed marketing, not some fancy New York editor's concept of quality. Specific examples (especially his own successful self-publication record) is evidence to Poynter that his size fits all. A little hyperbolic, do you think? For myself, I'm still partial to wheat from which the chaff has been separated ... at least for now. I just got home from the seventh annual San Francisco Writer's Conference (with plenty to type about ... but this first post will be a short one). Why "One Finger Typing"? I picked that name a little over a year ago, when I almost decided to start blogging but didn't. It's the obvious reference -- what's the sound of one hand clapping? -- and I mean it as a reminder to myself. If I'm blogging, I'm not writing fiction ... even if I'm thinking about it ... so the title is a warning that too much time spent here is leaving the "real work" idling.